In summer 2013/2014 tiny & little was thrilled to partner with Melbourne with Kids expert, Kate Nelson from Meetoo and the National Gallery of Victoria (NGV) to present Roll Around the Block for Melbourne Now. 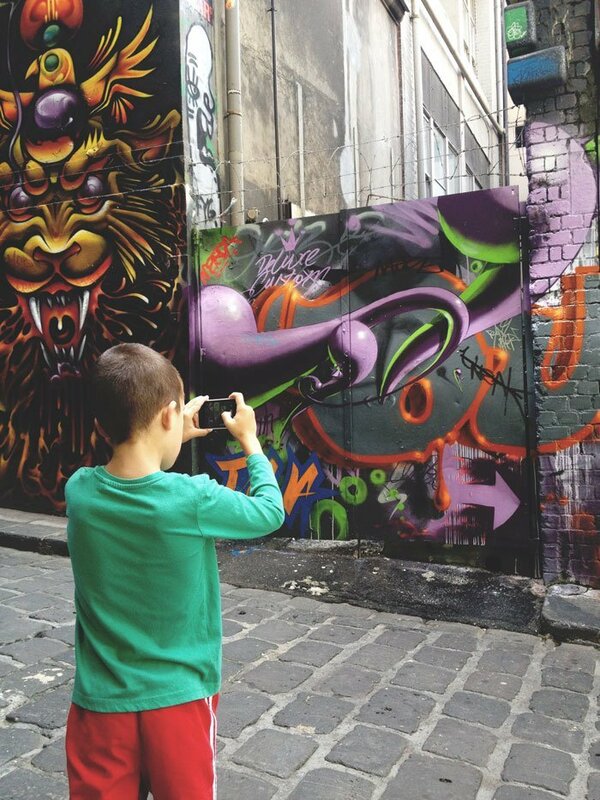 In this interactive photography project, Roll Around the Block was taken to the streets of Melbourne as children were invited to capture the city and its people from a child’s perspective and participate for the chance to have their photo featured at the NGV. Meetoo and tiny & little also hosted a workshop, Digital Goes Art, at the NGV in January 2014 where children interpreted photos as art. As part of the NGV Melbourne Now Children’s Festival, children aged 2-12 years were invited to undertake a roll around the block – a kid, a camera and 24 shots. Photographs submitted via Instagram or Facebook using the hashtag #rollaroundtheblock and #melbournenow were selected by Meetoo and tiny & little for inclusion in a digital display at the NGV and below you can see the Festival Favourites. Roll Around the Block is a photography project created by tiny & little in which children are invited to embrace the photographer within. Based on the simple premise of kids ’shooting a roll of film’, children are encouraged to take 24 photos which capture their view of the world around them. Through the limitation on the number of photographs, children are inspired to slowly observe and record their environment, while learning basic photography skills and counting. Here at tiny & little, we did our first ‘roll around the block’ in 2009 with a then three year old Mr Little and we continue to do them to this day. We’d love for you to join us too – be sure to tag tiny & little on social media so we can take a look at your little photographer’s shots. You can view photos from our most recent rolls around the block through the links below or by visiting the Roll Around the Block archives. How do I play Roll Around the Block? Where can I take photos? You can do this activity almost anywhere. A block can be as simple as the block you live on (or even around your house) or you can turn this into an adventure in your own city. Why is it 24 shots? 24 shots was chosen as it’s the number of frames on a traditional roll of film. The aim of only 24 photos is to encourage children to consider and pause before taking each photograph. This can be harder for smaller children, so you can tailor the exercise to suit the age and temperament of your child – for example, you might like to do a 12 or 36 shot roll. I need photo ideas for encouraging my little photographer – can you help? Absolutely! tiny & little publishes photo ideas to help if photographer’s block strikes and you can read our photo prompt posts here. Do you have tips for using a camera or taking photos that I can share with my little one? Along with the photo ideas, tiny & little shares camera and photography tips and you can read our photography tips posts here. Please keep in mind though that some of the best shots can come when we ‘break the rules’ and letting your little one play with the settings is important.